On the surface, Mitt Romney’s selection of Paul Ryan as his vice-presidential running mate is both daring and smart. It’s daring, obviously, because Ryan’s budgetary vision of a drastically reduced federal government presents such an existential threat to liberalism that it may unite Democrats in a death-or-glory stand behind President Obama. But it’s smart because Ryan has been one of the only Republicans since Ronald Reagan capable of inspiring the right while reassuring moderates. Indeed, one of the refrains of Ryan's career has been his courtship of moderates within his party and outside of it. This is a strategy with a proud tradition in the modern Republican Party, hailing back to the landmark efforts of Ronald Reagan, Dwight Eisenhower, and William F. Buckley. But if Ryan has been reasonably successful at that task until now, his effort will most likely soon come precipitously undone. Moderates around the country will be tempted to vote for the GOP this year, but as they are made to take a closer look at the radicalism of Ryan’s budget and of his intellectual influences, it's safe to say they won't like what they find. This is a reality that Ryan's affable personality simply won't be able to paper over. And so, rather than bolster the cause of conservatism, it's far more likely that Ryan’s selection will have the opposite effect—that of undermining the long-term viability of the Republican Party. Like Ryan, moderates worry about unsustainable spending levels and metastasizing deficits, and agree that painful actions must be taken to reduce healthcare spending in particular. Ryan won the respect of many moderates by grappling with the numbers and producing concrete budget proposals, which passes as an act of breathtaking political courage in Washington these days. He has helped to counter the perception that Republicans are just negativists and obstructionists, bereft of ideas. Indeed, when Ryan grilled Treasury Secretary Timothy Geithner at a hearing in February, it was the Democrat who seemed out of ideas, admitting to Ryan that he didn’t have a “definitive solution” to the long-term problems of unfunded liabilities and rising deficits. But the fact is that Ryan’s budgets are not moderate documents, and Ryan’s plan is not fiscally conservative but radical. Fiscal conservatism, if it means anything, requires that policymakers use both revenue increases and spending cuts to bring the budget into balance over the long term. 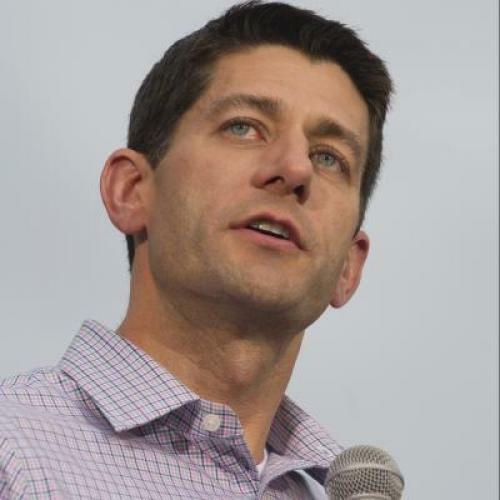 By refusing to consider any tax increases at all, and in fact proposing to slash corporate and individual taxes by some $4 trillion above and beyond the Bush tax cuts, Ryan sides with those for whom fiscal policy is a matter of theology rather than economics. The fiscally conservative leaders from the GOP past, such as Dwight Eisenhower, would be appalled by the decades of deficits the Ryan plan envisions and puzzled by the apparent sacredness of the military budget; Ike cut military spending by 27 percent but Ryan would not reduce it by so much as a nickel. Eisenhower also believed that lean government was compatible with government investment in sectors with a high return to society, such as science and education, while Ryan’s plan would reduce government discretionary spending in areas such as these to approximately zilch. Indeed, according to the Congressional Budget Office, Ryan’s budget ultimately would shrink government spending to a lower level as a percentage of GDP than at any point during Ike’s presidency. Ryan’s scheme to turn Medicare into a capped voucher program would shift much of the burden of medical spending onto individuals but would do nothing to address the fact that the United States pays more for healthcare than any other developed country but gets worse outcomes. Contrast Ryan’s proposal with the example of Melvin Laird, another true fiscal conservative and former Republican Congressman from Ryan’s home state of Wisconsin during the 1950s and ‘60s. Laird believed that the best way to cut medical costs was to invest in medical progress and cures; the partnership of Laird and Rep. John Fogarty (D-RI) was principally responsible for the modern development of the National Institutes of Health and the Centers for Disease Control and Prevention, both of which would be threatened by the Ryan budget. It’s possible that the budget plan is just Ryan’s extremely, extremely aggressive negotiation opener, and that at a moment of crisis in some smoke-filled room (or its healthful present-day equivalent; Ryan after all is a physical fitness fiend) he would be capable of finding compromise with Democrats. But the evidence strongly suggests that he believes what he says, and his emergence as a Tea Party hero means that he would have great difficulty modifying his positions even if he wanted to. The problem with Romney’s selection of Ryan is not only that it commits the GOP to the budget’s radicalism; it’s also a symbol that both the GOP and the conservative movement are coming unmoored from their traditional beliefs and restraints. Consider Ryan in view of the legacy of William F. Buckley, who is generally considered the founder of the modern conservative movement. Buckley felt that perhaps his greatest achievement was to have repulsed the two principal extremist threats to the movement in the 1960s: the John Birch Society and the “Objectivists” centered around the writer Ayn Rand. As various commentators have pointed out, the Tea Party has revived and re-popularized the Birch Society’s outlandish views, and no Republican leader has attempted to refute them. Now that the party's vice-presidential candidate is the most prominent Rand-influenced politician in the land—Ryan said in 2005 that Rand was “the reason I got involved in public service”—the other half of Buckley’s achievement has come undone. It would probably be in Paul Ryan’s best long-term political interests, however, if his budget remains a standard for conservatives to rally around rather than becoming actual policy. For their part, moderates will be firm in their belief, however much Ryan tries to convince them otherwise, that such an outcome would also be in the long-term interests of the country.